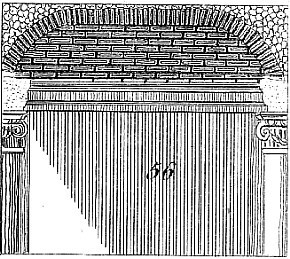 Scuptor and architect; b. June 18, 1511, at Settignano, near Florence; d. April 14, 1592. He began as a pupil of the sculptor Bandinelli, but afterward went to Jacopo Sansovino in Venice, whom he assisted, with Cattaneo, Alessandro Vittoria, and others, at the Library of S. Mark. Returning to Florence, he formed his style on the Medici tombs by Michelangelo. Ammanati went to Rome during the reign of Paul III (Pope, 1534-1549) and assisted Vignola and Vasari at the Villa di Papa Giulio. Returning to Florence in 1557 and the service of the Duke Cosmo I de' Medici (b. 1519, d. 1574), Bartolommeo made the fountains of Pratolino and Castello and the beautiful bridge of S. Trinità (Florence, 1567-70). In 1559 he won the commission for the fountain of Neptune in the Piazza della Signoria, Florence, in competition with Benvenuto Cellini, Gian Bologne, Vincenzo Danti, and Il Moschino. He built the garden facade of the Pitti palace, the second cloister of S. Spirito and the Palazzi Guigni, and Ramirez di Montalvo, in Florence. Ammanati began the immense ducal palace at Lucca, Italy, which was continued by Pini and Juvara. The Palazzo Micheletti in Lucca is also attributed to him. mason (Steinmetz); d. August 27, 1538. Hans Behaim built the Kornhaus at Nurnberg and the portal of the old Rathhaus. His son, Hans the Younger, succeded him. Coqueau probably came from Amboise (France). About 1538 he succeeded Pierre Nepveu as maître des œuvres of the châteaux of Chambord and Blois. He assumes this title in a letter written in 1541, which has been preserved. In 1556-1557 he was associated with Philibert de l'Orme in the inspection of the works at the bridge and gallery of the châteaux of Chenonceau. He probably continued the construction of the right wing of the château of Blois begun under François I.
architect; b. 1518; d. 1558. A son of Girolamo Genga. In 1538 he came to Florence and was associated with Vasari and Ammanati (above). He was employed by the Duke of Urbino at Pesaro and Urbino. Vaulting by Michael Angelo under the porticos of the ground floor of the palace of the Conservators at the Capitol. 3. Façade of one of the palaces constructed at Rome by Michael Angelo, on the Place of the Capitol. 4. Staircase to the senatorial palace on the Place of the Capitol, work of Michael Angelo. 5. 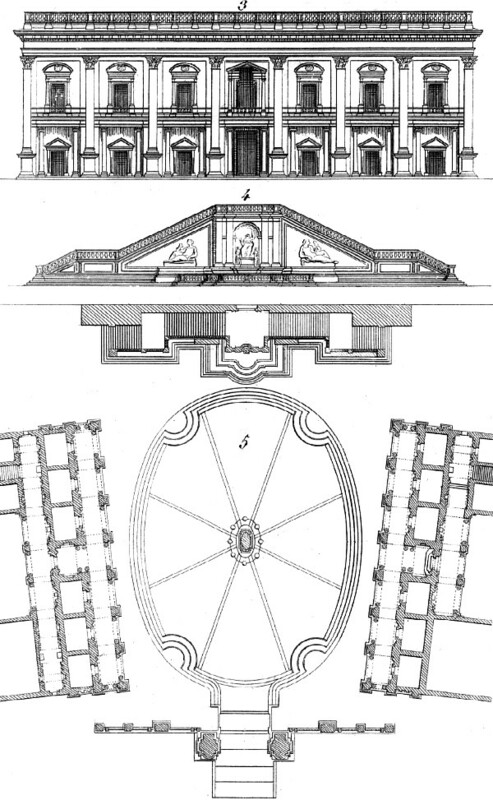 General plan of the Place of the Capitol by Michael Angelo; on the left is the palace in which is the celebrated Museum of Antiquities; on the right, the Palace of the Conservatore; at the end, the palace of the Senator; and in the center, the pedestal, on which is the equestrian statue of Marcus Aurelius. 1. Portion at large from the façade of one of the palaces on the Place of the Capitol. 2. 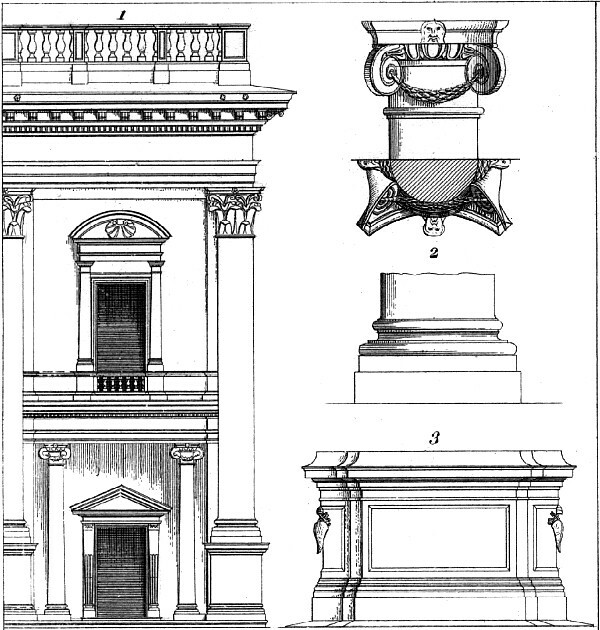 Base and capital of the Ionic columns of the portico, on the ground floor of the same. 3. Pedestal of the equestrian statue of Marcus Aurelius.